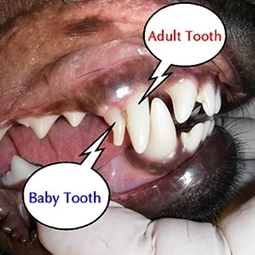 As puppies and kittens grow, their deciduous, or baby, teeth begin to fall out as their adult teeth come in. Sometimes, however, baby teeth do not fall out properly as the adult teeth are coming in, causing them to be retained, and the adult teeth to be in abnormal positions. This causes crowding in the mouth, which can lead to dental cavities, abnormal bite pattern, and abnormal jaw position. While more common in puppies, it has been observed in kittens, as well. During a sedated procedure, your veterinarian can extract any retained baby teeth to alleviate pressure and crowding of adult teeth. The cost is $12.00 per tooth (no cost is accrued if no teeth are extracted).